For more than 30 years, the American Girl Benefit Sale has restored and resold overstock and returned merchandise donated by American Girl and Mattel. Run by Madison Children’s Museum, proceeds from the benefit sale go to support the museum and the American Girl Fund for Children. The sale takes place over two days in July and is in-person only, located at a warehouse in Middleton, Wisconsin. Items are not sold online or by phone. The benefit sale happens in two main parts: the Saturday Sale, which requires paid tickets, and the Sunday Markdown Sale, which has paid tickets only for the first two hours, and free, walk-up tickets for the rest of the day. Discounts begin at 30% or more off retail prices on Saturday, and many items are further marked down on Sunday—often as much as 70% off retail prices. The annual American Girl Benefit Sale attracts up to 7,000 shoppers from all over the country and raises around $1 million dollars each year. All funds raised support the exhibits and programs of Madison Children’s Museum and American Girl’s Fund for Children, which, in turn, provides grants for charitable programs for children throughout Dane County. A dedicated corps of 150 museum volunteers work year-round to prepare for the event, with an additional 150 on site during the sale. More than 30,000 volunteer hours are logged annually. All of the merchandise is either overstock or returns donated by Mattel and American Girl to Madison Children’s Museum. Saturday Sale prices are approximately 30% less than a catalog or store purchase. Some items may be reduced even further depending on how much inventory we have. Some discontinued items, such as previous Girl of the Year dolls, may be priced closer to their original retail cost. Madison Children’s Museum has the right to change the prices based on availability from year to year. The Sunday Markdown Sale prices are based on what does not sell on Saturday. You will find most items are about half off, and as much as 70% off on some items. We are not able to release a comprehensive list of available items. We also cannot guarantee the availability of any item at a particular time during the sale. Donations of sale items from American Girl and Mattel come in gradually, some arriving just days before the sale. Shortly before the sale, we do publish a list of prices for general categories of items, such as Truly Me or Bitty Baby dolls, and may include prices for specific items where we have larger quantities in stock. We do not provide prices or confirm the availability of items not included on that list. There are purchasing limits on most of the inventory. The limits are set to provide as many shoppers with as much choice as possible, while still earning funds for the causes the sale supports. Limits will be included in the item list published before the sale. To ensure that you receive all sale communications, please subscribe to our email list. We accept cash, Visa, MasterCard, Discover, and American Express—no checks or traveler’s checks. Outside merchants in our vendor fair may have other payment preferences. Please note, this is a short introduction to sale ticketing policies. For detailed information, see the Ticket Information page. The Ticket Lottery Presale offers motivated shoppers the chance to get the earliest possible entry slots for the Saturday Sale—and the ability to purchase the earliest Sunday entry slots. Tickets are purchased online and every shopper who places a ticket order on the same day has an equal chance of getting the earliest slots available that day. Tickets go on sale in early spring. The General Sale offers shoppers the chance to select from their preferred time for Saturday tickets. Ticket times will be after those distributed during the Ticket Lottery Presale. General tickets also go on sale in spring, about two weeks after the Ticket Lottery Presale. Free Tickets to the Sunday Markdown Sale are distributed on-site on Sunday morning, for entry times after the early-entry tickets sold during the Ticket Lottery Presale. All free Sunday tickets are first-come, first served. Tickets are distributed at the sale information booth, located at the street entry to the sale area. All persons entering the sale, including children, must have a ticket. Children under three are not permitted in the sale warehouse, due to safety concerns. For all questions and information related to ticketing, see the Ticket Information page. Should I attend Saturday, Sunday, or both? Will you have Logan/Samantha/Molly (or any other specific item)? Should I bring my child to the sale? I have limited mobility; is the sale accessible? Is my ticket purchase or purchase at the sale tax deductible? Will I have to pay sales tax? All sale proceeds are divided between Madison Children’s Museum and the American Girl Fund for Children. That fund, in turn, makes substantial grants to about two dozen local and regional organizations working on behalf of children in the area. Madison Children’s Museum oversees the logistics of the sale, but the event is a success because of our dedicated volunteers. Approximately 150 volunteers work year-round at the warehouse to repair dolls and organize inventory. Over 300 volunteers help out on-site sale weekend. The Saturday Sale will have more merchandise, priced at an average of 30% off retail. Per-item limits are lower on Saturday to preserve selection for as many shoppers as possible. If there is a particular doll or item you are looking for, we recommend you shop on Saturday. Sunday Markdown Sale product offerings consist of what did not sell on Saturday—but at a further reduced price. Per-item limits are increased for many items on Sunday. People like to shop on Sunday for the deepest deals and to buy multiple items, but there are not as many choices as on Saturday, and individual items sell out more quickly. No product is held back or added to the floor at any point during the sale. Some shoppers choose to attend both days! Tip for new shoppers: If you’re still not sure when to come, consider getting one of the later tickets on Saturday afternoon. The atmosphere is the most relaxed and you’ll have more selection than on Sunday. You can always come back the next day for free! When we have a truly large number of a single item early in the season we will sometimes feature that item in a sneak-peek on our Facebook page. A few days before the sale we release a price list that contains prices on general categories of items (e.g., Bitty Baby Gift sets or Truly Me dolls) and prices on a few specific items of which we have high quantities (e.g., Melody’s Bed or 18″ Samantha doll). Beyond those two specific exceptions, we cannot confirm the presence or absence of any item. We also cannot guarantee that any given item, including those featured in the price list or sneak-peeks, will still be in stock at any given time after the beginning of the sale. Many families come to the sale with children. It can be a fun, family outing around a shared passion for American Girl. In addition to shopping at the sale, there are usually performances by local youth dance groups, an American Girl–themed photo op, and a kids’ crafts table. All attendees, including children three and over, must have a ticket to enter the warehouse. Children under three, including babies in carriers, are not permitted in the warehouse for safety reasons. If you are shopping for “Santa” or for other surprise presents, you’ll likely not want to bring your child into the warehouse, as there is no good way to hide what you are purchasing. The sale can be exciting, but there are aspects that may be trying for some younger children. We do our best to move people into the warehouse quickly, however you may have to do some waiting. We publish live updates of entry times on our blog, Facebook, and Twitter, so you can wait with your child somewhere comfortable. It is also important to manage expectations. You and your child won’t know exactly which items will be present, so make sure you have backup plans (e.g., “My first choice is Tenney, but if they don’t have her, I’ll be happy with any BeForever doll.”) Some parents use the sale as an opportunity to teach their children budgeting and planning skills. We welcome people of all abilities to the sale. The location of the sale is accessible, with some limitations. Parking: A limited number of parking places are available on the sale grounds for those with a current, valid disabled parking permit. You may also park at the Capitol Ice Arena and take our shuttle to the sale ground. The shuttle drop-off and the disabled parking area are a short walk from the sale grounds via a paved surface down a gentle slope. Mobility Assistance Devices: Wheelchairs and walkers or other mobility assistance devices are permitted in the sale ground and in the warehouse. If you have difficulty standing you may sit in a designated area near the door of the warehouse until your entry group is admitted. Accessible portable toilets are available at the sale grounds. Shuttle Carts: Motorized carts are available to transport anyone who needs assistance. They cover the sale grounds—from the entrance at the road, along the disabled parking, and to the sale entrance or vendors, and back. Transporting Your Purchase: Wheeled devices not being used for mobility assistance, including wagons, strollers and wheeled suitcases, are not permitted in the warehouse. Once you have completed your purchase, a volunteer can help transport your purchases in a numbered shopping cart to our loading area. You can bring your vehicle to the loading area while a volunteer watches your purchases. Service Animals: Trained service animals are welcome in the sale grounds and in the warehouse. 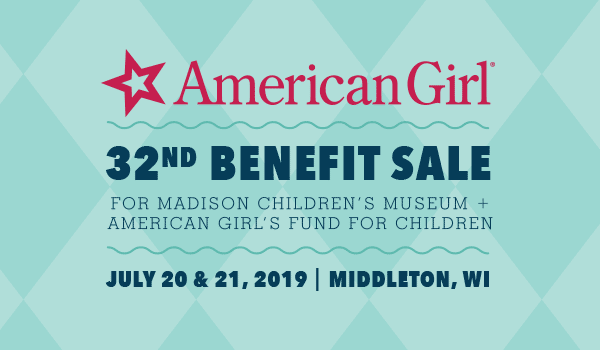 Though the American Girl Benefit Sale benefits the Madison Children’s Museum, a 501(c)(3) nonprofit organization, ticket and merchandise purchases are not tax deductible as charitable contributions under IRS guidelines. Established ticket prices are equal to the value of the benefit provided to attendees. Merchandise prices are discounted and are below the fair market values of the merchandise sold. Therefore, no portion of these purchases are tax deductible. When you check-out at the sale, you may be asked if you want to round-up your purchase. You may choose to round-up to the nearest dollar or some shoppers choose to give more. The extra amount you round-up is a donation and is tax deductible to the extent allowed by law. The donation is noted on your receipt and you should save that receipt for your tax purposes. You should also expect to pay sales tax on your purchases at the benefit sale. Wisconsin has a state sales tax rate of 5.5%.